A. 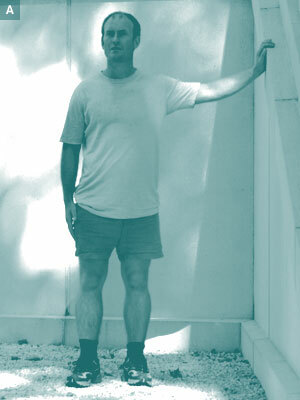 Stand less than arms length from the wall with left hand against the wall. B. Standing on the right leg, point the left leg to the right, behind the right leg. C. Push the left hip towards the wall whilst pushing the upper body away from the wall. You should feel the stretch down the left low back/hip. If you feel a stretch on the inside left thigh, change your body angle so as to feel the stretch in your hip. Repeat both sides 10 times.